Great Western Railway is celebrating capacity increases and huge on-board service improvements with a new advertising campaign across print, digital and radio, with The Times and Global-owned radio stations, LBC and Classic FM. Created by Wavemaker North, the campaign aims to engage business customers who might otherwise be using cars or airlines for their business travel. Wavemaker have partnered with LBC to bring podcast listeners a six-part series, Get Productive. The podcast series features short interviews with business leaders across the UK. Each episode covers topics such as time management and includes techniques on how to deal with stress, with the aim of helping people looking to increase their productivity at work. 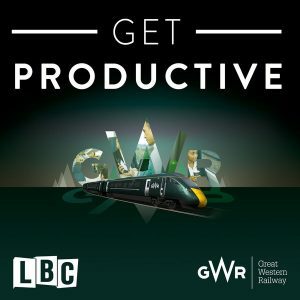 Get Productive is the first branded podcast series from LBC, Britain’s biggest commercial news talk station. The podcast is supported by radio ads running across LBC and its sister station, Classic FM. Listeners can stream or download for offline listening Get Productive episodes from Global’s Entertainment hub, Global Player and other major podcast platforms. The podcast series is supported by an online content hub, containing competitions to win prizes and further information about the upgraded GWR service, hosted on the LBC and Classic FM websites. The campaign also includes two CEO-led video pieces documenting their journeys to success, which are being distributed across the Unruly network; and print features in The Times. These will show how CEOs use their business travel time more efficiently with the on-board comfort of GWR services, to aid productivity.